The mind of Kingo was moved by Nichiren's every word. Nichiren grasped that facial expression of Kingo included some shade. Kingo was surprised. Can this person read my mind? Nichiren leaned forward to hear what he said. Kingo put his hands on the floor on an impulse. A voice broke out with Kingo answering all at once from behind. There are large number of people when he turned around in wonder. In that people, there were Toki Jonin, and feudal lord Yoshitaka Kudo of the Awa country Amatsu prefecture. Furthermore, Ikegami brothers of Munenaka and Munenaga whose father is the commissioner of buildings of the Shogunate. Also, Hiki Daigaku Saburo is the Confucianist of Shogunate officer. They have been hearing a talk of Nichiren behind Kingo. Kingo blushed and lowered the head to everyone. Nichiren was 35 years old, Shijo Kingo was 26, was 9 years younger than Nichiren at this time. Yoshitaka Kudo was 23 years old, Hiki Daigaku Saburo was 55. Shijo Kingo and Ikegami Munenaka and Hiki Daigaku Saburo were in Kamakura, and Toki Jonin and Yoshitaka Kudo were Shimousa. They had become the followers of influential Nichiren afterward. They will give their life to spread the marvelous Law of Buddha while encountering many persecutions as the core of the believer. The propagation of Nichiren continues moreover. The person who wake up to the Lotus Sutra in the vassal of the Shogunate appeared. Shijo Kingo and Toki Jonin served the vassal of Shogunate, but the understanding person of the Lotus Sutra appeared in the nerve center of the Shogunate. Yadoya Mitsunori is the one of them. He became a priest as a layman, and he introduced himself as the lay priest Yadoya, but Yadoya is known as the closest aide to regent Tokiyori Hojo. According to the Mirror of the East, there is the name of Mitsunori Yadoya who was one of seven vassals permitted nursing on the occasion of the end of later Tokiyori. Nichiren encounters Yadoya, and exchanges of opinions. Yadoya meant well to Nichiren who had the excellent discernment to the Law of Buddha though he was unknown and was not high-ranking priest. The young Buddhist priests who became disciples of Nichiren gradually increased. Nissho was one of them too. He became the disciple in November about six months later from when Nichiren declared the establishment of denomination in April 28, 1253. The birth is Shimousa country Kaijo prefecture Note volost. He is older a year than Nichiren. When he was about 15 years old, he become a priest in a temple of Tientai denomination and learned Buddhism of Tientai in Mt. Hiei-zan. Hearing the establishment of Nichiren denomination, he went to Kamakura and he became the disciple and trained himself in the thatched hut of the Matsuba Valley. Nissho felt an indication of a person at the entrance of the thatched hut on that day and said to Nichiren. Kingo stood at the entrance, hat in hand and lowered the head awkwardly. Usually arrogant Shijo Kingo dare not show his face unusually. Nichiren has begun to talk calmly. “A convulsion of nature, famine, and a pestilence are spreading in this country at present. In the Law of Buddha, the world of these pains is called impure land. It is the dirty world. However, if the minds of all life are impure, their land is also impure, but if their minds are clean, so is their land. The pure land and impure land are not separate. This difference is solely from the virtue or evil of our minds. It is the same with the Buddha and a common mortal. While strayed, one is called a common mortal, but once attained Buddhahood, one is called the Buddha. For example, even an impure mirror will shine like a jewel when we clean it. Likewise, a mind that is presently clouded by illusions originating from the fundamental darkness of life is like a un-cleaned mirror. Yet, once it is cleaned, it will become a clear mirror of absolute truth. Arouse deep faiths, and diligently polish your mirror day and night. How should you polish it? If you chant Nam-myoho-renge-kyo single-mindedly, this means polishing it. You were born in the house of the samurai. Now although there is not a war, you are having the fate to murder other people or not knowing whether you lose your life either. In addition, because you serve a lord you should make an outstanding job, and be diligent to keep your territorial possession. However, it is the prosperity in the dream or the pleasure which is not rare, even if you got many fame and fortune. Single-mindedly chant Nam-myoho-renge-kyo and encourage others to do the same. This will remain as the only memory in this present life of yours in this human world." On the other hand, Toki Jonin who became a believer of Nichiren was working for the Chiba's mansion of Kamakura. Toki is senior to Nichiren by 6 years. He was a sensible person all the more. Chiba who was a lord of Toki had domains in the whole country. There were territories in Kinki and Kyushu including Shimousa. Jonin was busy with the handling of the trial, the collection of the land tax, the transportation of supplies, financial management as a bureaucrat of lord Chiba. Father of Toki is from Inaba (Tottori) originally. There was the original territory in the Toki prefecture of the Inaba country. Because father served the Chiba, Jonin of the child entered Kanto and he worked either. Parent and child of Toki were able bureaucrats. The war of Zhokyu is already over, stability of the reign is the urgent business. The influential person like Chiba had been seeking a talented government official. An administrative official displayed desk in the Chiba's house and did a writing. Busyness of the work is the same as a modern company. A horse and a cart went in and out to the plaza busily. Everybody looks at each other as like saying "Again!" A co-worker clapped his hands. The rural financial difficulty is not the thing which began from now. The people of the Middle Ages has been in trouble, too. They freely have used the forwarding agent, and merchant who was called Bashaku, and digested instructions of the Shogunate. If the crop of the land tax is a distant place, Bashaku collects it. It was a kind of the money order. The faith to the Lotus sutra of Toki is famous. They resumed their job with a bitter smile. When they sort out a document, they have been throwing away papers which they had finished using. Jonin picked up that paper and gathered it. The co-worker looked at him with a dubious look. What does he use the used document for? The sunset shined in the thatched hut of the Matsuba Valley. Nichiren takes the writing brush. He writes to used documents which was given from Jonin. The surface has been written in, but the back side is still usable. These papers had been used by the government official of the Chiba including Jonin. Paper was precious in those days. It was valuable so as to recycle and reuse paper. Jonin sent used papers, and Nichiren and disciples copied the Buddhist sutras or Tientai's writing into the back side of this poor-quality paper and studied. By the way, thanks to this, the document of the Chiba clan written to the surface has come until the present day, it becomes precious documents written on the reverse sides which are able to know the Kamakura era. Shijo Kingo, the samurai who rode a horse went ahead through the town of Kamakura leisurely. A vassal takes the mouth of the horse. Kingo passed through the gate of the his residence and called it aloud. Nichigannyo of the wife appeared. Two people go to the back room. The baby is sleeping at the futon when they open the door of the room. Kingo looked at the sleeping face of the child. Always stern Kingo showed the expression that was full of affection. Nichigannyo of the wife told him to mutter. “We should observe the situation a little more maybe. Sometimes this baby gets a little better but then she has a relapse, does not she?”. The small bottles formed by soil are displayed in the room of Kingo. Kingo was good at a medicinal herb. He was the pharmacist or doctor in the present day. He has the achievement that cured the illness of his master. He mixed medicine by a spoon and placed it in a dish. And he handed drug to Nichigannnyo. Shijo Kingo is the Shogunate vassal serving Mitsutoki Hojo (also Mitsutoki Nago'e). Father of Mitsutoki was younger brother Tomotoki of a wise ruler Hojo Yasutoki. Not a direct descendant of Hojo. Yet people respected them only introducing themselves as Hojo. The name was known as a vassal of Mitsutoki whose Shijo Kingo continued two generations in Kamakura. But in particular he was famous that his character was extremely obstinate and was short-tempered. There is a big hearth in the center of the living room. A maid began preparations for dinner. Nichigannnyo felt downcast, but she pulled herself together and poured liquor into the cup of Kingo. Nichigannnyo stared at Kingo smilingly. Kingo gave a dirty look frankly. Nichiren's words oddly stuck with him. This brings to mind a story. A father, anxious about his son’s future, thrashed the boy with a bow made of zelkova wood because he refused to study. There was a father who, upset that his son was neglecting his studies, paddled him with a zelkova wood bow. At the time, the son resented his father’s action and hated the zelkova bow. At the time, the son considered his father a cruel man and resented the wooden bow. However, he applied himself to his studies so much that eventually he [mastered Buddhism], thereby achieving emancipation himself and benefiting others. Nevertheless, he devoted himself to the study and practice of Buddhism, eventually becoming highly accomplished and able to teach many people. In retrospect, he saw that he owed his achievements to his father’s thrashings. Looking back, he realized that all his success was due to the thrashing given by his father. It is said that he erected a memorial tablet made from a zelkova tree for the repose of his deceased father. In gratitude, he offered a zelkova wood memorial tablet (Sotoba) to honor his father’s memory. It is the same with me. Is it not the same with me, Nichiren? When I attain Buddhahood, how will I be able toforget my obligation to Shō-bō? How can I forsake my debt of gratitude to Sho-bo for helping me attain Buddhahood? Much less can I forget the thanks I owe to the scroll of the Lotus Sutra [with which he struck me]. Even less, should I forget my debt to the scroll of the Lotus Sutra with which he struck me? When I think of this, I cannot restrain my tears of gratitude. Thinking of this, I can hardly hold back my tears of gratitude. When we examine this wide variety of sutras, we find that they all stress how grave a matter it is to slander the correct teaching. Thus, by thoroughly reading all of these sutras, you will find that they all point out the grave consequences of slandering the Law. How pitiful that people should all go out of the gate of the correct teaching and enter so deep into the prison of these distorted doctrines! How lamentable it is that everyone has walked out of the gate of the correct Law and entered into the prison of erroneous teachings! How stupid that they should fall one after another into the snares of these evil doctrines and remain for so long entangled in this net of slanderous teachings! How foolish people are to be caught by the hook of evil doctrines and become eternally entangled in the net of slanderous teachings! They lose their way in these mists and miasmas, and sink down amid the raging flames of hell. In this lifetime, the people’s ability [to seethe correct Law] is obscured by a dense fog, and in future existences they will be engulfed by the roaring flames of hell. How could one not grieve? How could one not suffer? How can we not grieve? How can we not agonize? Now if we examine the present situation carefully in the light of this passage, we will see that the various spirits have for some time been rampant, and many of the people have perished. If we contemplate on the current reality in light of these sutras, we can see that a hundred demons have been running wild, and a great many lives have been lost. If the first predicted misfortune in the sutra has already occurred, as is obvious, then how can we doubt that the later disasters will follow? It is clear that the disasters depicted in these sutras have already taken place. How can we doubt the occurrence of the remaining disasters? If, in punishment for the evil doctrines that are upheld, the troubles that have yet to appear should fall upon us one after the other, then it will be too late to act, will it not? What will you do if these disasters occur simultaneously and relentlessly as a result of the people taking faith in erroneous teachings? Earlier, in the Gennin era (1224–1225), petitions to the throne were submitted time and again by the two temples of Enryaku-ji and Kōfuku-ji. And as a result, an imperial command and a letter of instruction from the shogunate were handed down, ordering that the woodblocks used in printing Hōnen’s Nembutsu Chosen above All be confiscated and brought to the Great Lecture Hall of Enryaku-ji.There they were burned in order to repay the debt owed to the Buddhas of the three existences. To continue, in the Gen’nin period [1224-1225 CE], both Enryakuji and Kofukuji Temples frequently sent official letters of appeal [asking the emperor to prohibit the propagation of the Nembutsu teachings]. The emperor finally issued an imperial order, and the shogunate set forth a decree. As a result, the woodblocks of Honen’s The Sole Selection of Nembutsu were seized and brought to the Great Lecture Hall of Enryakuji Temple and incinerated in order to repay the debts of gratitude owed throughout the three existences to all Buddhas. In addition, orders were given that the menials at Kanjin-in Shrine should dig up and destroy Hōnen’s grave. As for Honen’s grave, the lowest-ranking servants of the Kanjin-in Shrine destroyed it, obeying the aforementioned orders. Then, Hōnen’s disciples Ryūkan, Shōkō, Jōkaku, Sasshō, and others were condemned by the imperial court to exile in distant regions and were never pardoned. Honen’s disciples such as Ryukan, Shoko,Jokaku, and Sassho were individually banished to remote lands, never to be pardoned. How could you possibly claim that not a single remonstration has ever been submitted to the sovereign? When everyone is blown to death by powerful winds, which instantly destroy the mountains, rivers, and trees throughout the land; or when there are unseasonable typhoons; black, red, or blue winds; tempests in the heavens and on earth; fire storms and wind-blown water surges---any of these aberrant occurrences is the fifth kind of disaster. Drought extending to every corner of the country, dying the very earth to the point of bursting into flames, withering plants and preventing the five grains from growing, burning up the nation, extinguishing all life----when this happens, this is the sixth kind of disaster. When foreign invaders attack the country from every direction and rebellion erupts from within, these outlaws overrun the land, taking advantage of fires, floods, and fierce winds. Rampaging rebels cause the masses to panic in terror as the world enters an age of war----this is the seventh disaster. The Hachiman Shrine is seen in the other side of the Wakamiya thoroughfare. A meeting began in government office which controlled state affairs and financial affairs of the Kamakura Shogunate. There are Tokiyori Hojo, brothers of Tokisuke and Tokimune, Shigetoki Hojo of the uncle of Tokiyori, and Yasumori Adachi were present. There was a Yin Yang fortune-teller in a farther seat. Tokiyori was irritated and loitered around. "This country is fascinated. The ominous occurrences in heavens, an earthquake, famine, a contagious disease. What does this mean? Was abandoned by God and Buddha? While Shigetoki Hojo watched the document which arrived from the shogunal vassals of each place, he muttered. The anger of Tokiyori does not have an outlet. 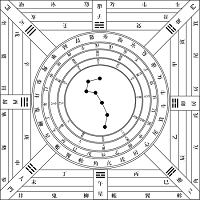 The Yin Yang fortune-teller looks in divination panel (note), and answers. Tokiyori who heard this swore. Audience flocked to Rengeji of Kamakura. It is a large temple of the Nenbutsu sect of Buddhism. The people said they could not but cling to Nembutsu for getting over the world of sufferings, and visited to there. In audience, there is Nichiren who wear a canonical robe and a shoulder robe of the thin Indian ink. Priest of the black robe, Nen'a began sermon before long. Nen'a calls the official name Ryochu Nen'a. He was born in Iwami Province (present Shimane Prefecture). He become a priest at 16 years old. He learned an Abhidharma-kosa and Tientai following Enshin and Shinren and trained himself in esoteric Buddhism following Mitsuzo and Gencho. He went to Chikugo to hear Buddhism of Ben'a Shoko and become the disciple afterwards. He open Rengeji (subsequent Komyo-ji Temple) in Kamakura and grant religious precept by a request of Tsunetoki Hojou in 1240. He is a Nembutsu priest to represent Kamakura. Nen'a begins to talk calmly. Nen'a smiled and nodded. Nichiren caught the smile. Nichiren crossed his arm and interested. Nen'a got angry for an instant. Nen'a has begun to be excited. Disciples of Nen'a expel Nichiren from the temple in a angry voice resounded through the hall. While Nichiren spread the Lotus Sutra, he went to the temple of other denominations and fought in the doctrine of Buddhism hard. It was worth, a large number of audience came to gradually flock to the thatched hut of Nichiren of the Matsuba valley. Nichiren talks to the people who visited the thatched hut powerfully. “Lord of teachings, Shakyamuni Buddha, said that he did not yet express the truth, preached the Lotus Sutra after 40 years of starting sermon. Therefore, Amitabha Sutra which was preached before the Lotus Sutra is the teachings of the means not to include the best Buddhahood preached in the Lotus Sutra. Lotus Sutra is the King of all the Buddhist sutras said to be 80,000 sutras, is ultimate teachings of Buddha. That is why it cannot come true that all people of the latter day of the Law attain Buddhahood if they do not chant Myoho-renge-kyo which is title of the Lotus Sutra. Priests of Nembutsu cannot beat Nichiren. Because Nichiren attacked the wicked doctrine of Nembutsu in a text of a sutra first of all, the person of Nembutsu was not able to resist him. There were many people who criticized Nembutsu of Honen from old days. The imperial order was promulgated, too. Mt. Hiei ever oppressed Nembutsu, too, but the teachings of Honen spread without stopping naturally. Nichiren has begun to stop it. Nichiren talks about the reason as follows. “Thus, when I was thirty-two, from around the spring of the fifth year of the Kenchō era, I began criticizing the Nembutsu and Zen sects, and later I attacked the Shingon sect as well." “At first the Nembutsu followers despise me, saying, ‘Even if clever Nichiren, he can hardly surpass the priest Myo'en, or the priest Ko'in of the administrator, or the chief priest Kenshin. These people at first attacked the priest Honen, but later they all capitulated and became his disciples or followers of his teachings, and Nichiren no doubt will do likewise.’ They sought to disprove my words one after another." "When persons in past times criticized Honen's teachings, they did not at the same time criticize those of his predecessors Shantao and Taocho, nor did they try to distinguish between provisional sutras and those that are true, as a result the Nembutsu believers only became more self-confident than ever.But now I, Nichiren, have Shantao and Honen fallen into the hell of incessant suffering, and have driven home my criticisms by comparing the three Pure Land sutras with the Lotus Sutra. It is like comparing the sun and moon with a firefly, or comparing the water of a small stream with the great ocean. Myo'en, Ko'in, Kenshin are each the Buddhist priests who submitted to Nembutsu. Above all, Kenshin was attracted by Nembutsu while being the head priest of the Tendai Sect and changed a religion. People of Nembutsu thought that Nichiren either was same and cannot win even if he blames Honen of the teacher. But the technique of Nichiren is different. He assumed the Lotus Sutra highest sutra and concluded three sutras of Pure Land that people of Nembutsu clung to to be a fictitious theory.In addition, he declared that priests including Chinese Shantao who was a teacher of Honen were in the hell of incessant sufferings. Words relating to Buddhism. Six purification days mean 8, 14, 15, 23, 29, 30th every month. It had been considered to be a day to spend with the observance of the commandments cleanliness both on six purification days of a month and on the equinoctial week two seasons. Rikujin-choku-ban in Japanese. A tool of the fortune-teller that a Yin Yan fortune-teller used. The disk which the Big Dipper or traditional Japanese music were written down is put on the square board which words and figures were written down. It is thought that this disk meant the heavens, that the square meant the ground. The Yin Yang fortune-teller of the Kamakura era foretold future by turning of this Rikujin-choku disk constantly.